Wild bison were eradicated from most of Alberta in the late 19th century. In 2016, however, Banff National Park reintroduced 16 of the animals into the Panther Valley, the first bison to live in that park in over a century. News of Banff’s efforts was widely celebrated. In our historical memories, bison thunder unconstrained across the province in the millions. Today, however, Alberta’s foothills are full of cattle and its prairies crisscrossed with barbed wire. Not everyone thinks reintroducing such a large species to a human-dominated landscape—even to Banff—is a wise idea. What obstacles face the returning bison? Is their return a token gesture? Can we, even in small ways, undo past ecological mistakes? 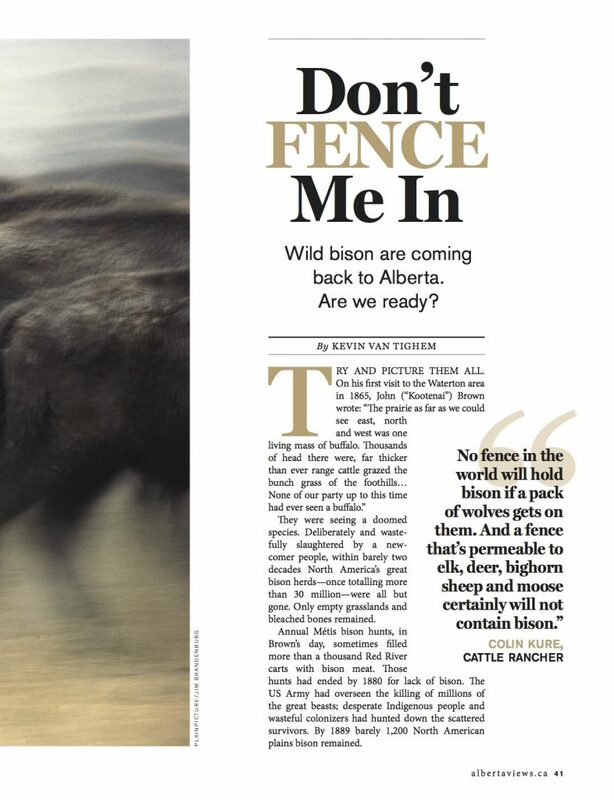 In the July/August 2018 Alberta Views cover story, writer and former parks superintendent Kevin van Tighem visits the land, wildlife and people most affected by the return of wild bison.